Boron Carbide, B4C, exhibits a number of important material properties, among them extreme hardness approaching that of diamond, and a very high melting point. However, it is the low density of the material that makes it attractive for applications requiring high mechanical strength and light weight. The properties of B4C are due to its unique crystal structure, which is composed of icosahedral units (B11C), linked by 3-atom chains (CBC) for a structural formula (B11C)-(CBC). Each B11C icosahedron is linked to six others by these three-atom chains, which give the three-dimensional arrangement its rigid nature. Understanding the high pressure response of B4C is critical to its use in laser shock applications. 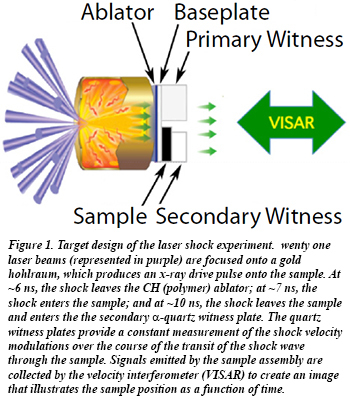 Experiments to date suggest two possible phase transitions, one between 30 and 50 GPa and one near 50 GPa, based on nanoindentation and shock wave experiments. Extrapolations into the high pressure region above 100 GPa suggest a soft material response, a feature which would limit its application in laser shock experiments. In recent work by a group from Lawrence Livermore National Laboratory and the University at Buffalo, including CDAC graduate student Andrew Shamp, CDAC Academic Partner Eva Zurek, former Carnegie/CDAC postdoctoral fellow Amy Lazicki and CDAC Steering Committee member Rip Collins, equation of state measurements using laser shock compression to 700 GPa have been carried out at the Omega laser facility at the University of Rochester (Fig. 1). Derivatives of the sound speed and Grüneisen coefficient suggest a rather stiff material response, in contrast to that predicted by lower pressure measurements, and also indicate a high pressure phase transition. 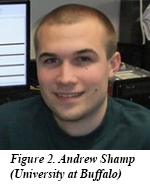 In support of the experimental work, Andrew Shamp has carried out finite temperature Density Functional Theory Molecular Dynamics (DFT-MD) simulations on B4C at the conditions of the laser shock experiments. Andrew’s calculations are in good agreement with experimental data and the derived sound speed measurements and have contributed to the development of a new equation of state model for B4C, which has been added to the Livermore Equation of State (LEOS) library [D. E. Fratanduono et al., Phys. Rev. B 94, 184107 (2016)].